The share price of United Company Rusal, the Russian aluminium monopoly, has dropped into the three Hong Kong-dollar range for the first time. In three years of its stock market history, the company’s chief executive, Oleg Deripaska, has let slip about $13 billion in value, two-thirds of Rusal’s original worth. At a current market capitalization of $7.9 billion, Rusal’s equity is now a fraction of its $10.8 billion net debt. Its debt to equity ratio is almost 10x; that is the worst ratio of any Russian oligarch, far ahead of second-placed Igor Zyuzin of Mechel at 7.6x. How can such a record be made to appear other than it is? You don’t have to know much about dynastic history – the process by which one greedy thug kills another, and then orders his public relations agents to depict the outcome as God’s will, and his lawyers to sue anyone who says otherwise. 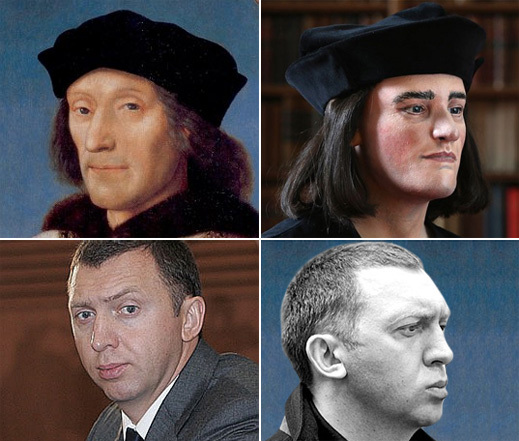 Look at the top two faces – it’s obvious, isn’t it, which of them won the English kingship in battle in 1485, killing the other, and sticking a dagger in his buttocks on the corpse’s way to an unmarked grave? Left, Harry Tudor; right, Dicky Plantagenet. Contrary to first impressions, but truer to history, the obviously nastier guy on the left was the winner. The rest is Finsbury history, errr, Tudor propaganda. For the left portrait is of King Henry VII, winner in 1485 and first in the 116-year Tudor dynasty. Painted in 1505 by an artist who may have signed his invoice but omitted his signature on the canvass, the painting hangs in London’s National Portrait Gallery. Preceding that picture on the same wall to Henry’s left by a few metres, is this one, purportedly of King Richard III, the last of the 331-year Plantagenet dynasty, and the loser in 1485 (see right). Recent analysis of the layers of painting on this canvass reveals that the narrowing of the eyes, the thinning and downward distortion of the lips were painted after the portrait had been completed, possibly in order for Henry VIII, another thuggish member of the Tudor family (right), to hang it in his personal gallery. In the Plantagenet case, it has taken another 527 years for the bones to be uncovered and tell their story; and for a reconstruction of how Richard actually looked on the eve of battle, so that a genuine image might compete with the lies in the media. RLM Finsbury is a London public relations firm belonging to Philip Lader, one of the directors on the board of United Company Rusal. Company documents label him an independent director. Hardly. It’s been Finsbury’s job to depict Deripaska in the best light – that’s to say, make light of his lossmaking. Rusal was well into its latest dive when an “exclusive” two-part video interview was arranged for Deripaska on CNBC business television, aired on March 14 (part 1 and part 2); then in print in two editions of the Financial Times, March 17 and 18. CNBC called him ‘Deripashka’; the FT got the spelling correct. Deripaska didn’t stumble and gulp as much as he used to do when he couldn’t answer difficult questions. But is this Finsbury’s, Lader’s, and Deripaska’s considered view of how to save the share price? Since neither interviewer asked for an explanation of Rusal’s operational or financial performance, it is the message they had agreed in advance that Deripaska himself would convey that is remarkable. This is because Deripaska tried pinning the blame for his company’s troubles on Russian government interference on the cost side of his balance sheet. At the same time, he intimated that it is the Russian government’s duty to stimulate growth in demand for aluminium and subsidize the enlargement of Rusal’s unsold inventory until that happens. “At the moment”, Deripaska said, “we still have high presence of government in regulation of the economy. We need to deal with it. We need to…finish reform of power market, we need to reform Gazprom.” In short, Rusal’s costs would be lower if the government would stop holding up gas and electricity prices, and instead transfer Gazprom’s profit to Rusal’s bottom-line. 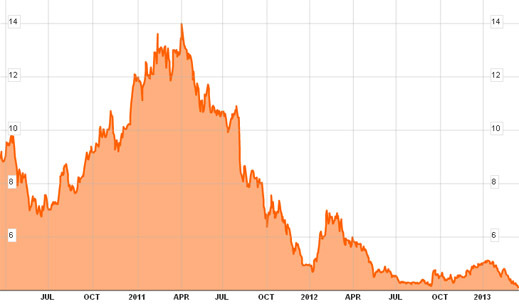 Then there ought to be lower bank interest rates for a borrower like Rusal. “The only opportunity for change is to reduce government presence in the economy… to create proper regulation for the power sector…and of course, we need to reform our financial institutions. We need to develop more banks”. Getting rid of government intervention on one side of the balance-sheet wouldn’t mean less government involvement on the other side, Deripaska said. He is in favour, for example, of government intervention to underwrite investment risk. Private investors won’t chance long-term investment “unless they believe there will be a guaranteed rate of return.” The only way aluminium producers like Rusal can achieve this now, he said, is for government “to invest more in containing capacity which is not utilized at the moment…we need to invest in reducing these free market stocks.” Deripaska is implying that either Rusal should cut metal output until market price and profitability improve; or else the government should “invest” (subsidize) in the costs of the accumulating metal inventory he can’t sell.